Listen to hear the latest from MPP with special guests Al Rojas and Cindy Sheehan. This month we discussed our groundbreaking Labor Community Campaign for an Independent Party, labor’s greatest break with the Democratic Party in years. We had Al Rojas, co-founder of the United Farm Workers of America with Cesar Chavez, to tell us about the international Driscoll’s Boycott day of action which took place on Saturday September 29, 2018. The Driscoll’s company produces berries and pays its mostly-Latino workers slave wages, employs child labor, forces people to work 12-hour days, and sprays workers with toxic pesticides. He also talked about the Sacramento labor-community alliance. Cindy Sheehan joined us to talk about the Women’s March on the Pentagon on October 20-21. We’ll also talk about each of our organizing programs, Tim Canova’s campaign, and how to get involved. 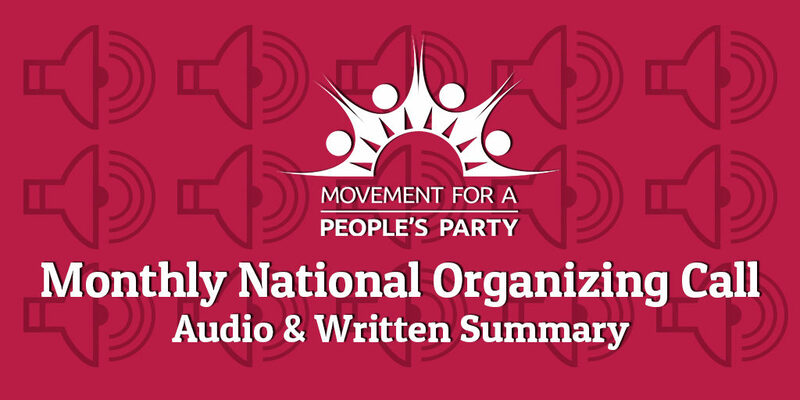 To a people’s party! *Hope you enjoyed our new intro/outro song courtesy of Ron Placone “Time for a Revolution” because it certainly is time!